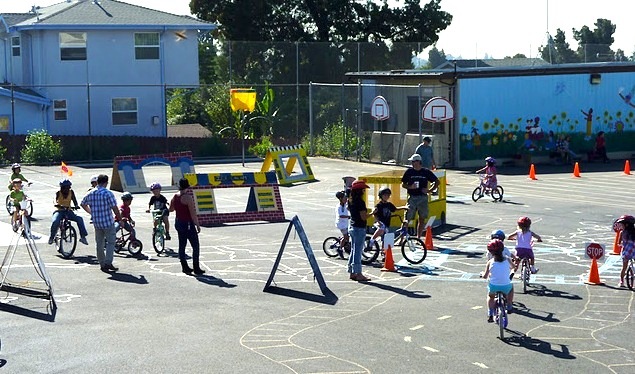 Cycles of Change provides Bike Rodeos at schools and community events in collaboration with Bike East Bay. We are able to offer two types of rodeos with enough helmets and loaner bikes for all participants. This Rodeo is well suited for groups of up to 20 3rd-6th grade students in structured during or after school programs. We teach advanced techniques using a course with lanes and obstacles. Visit Bike East Bay on the web to find if your school or event is eligible for a free rodeo. 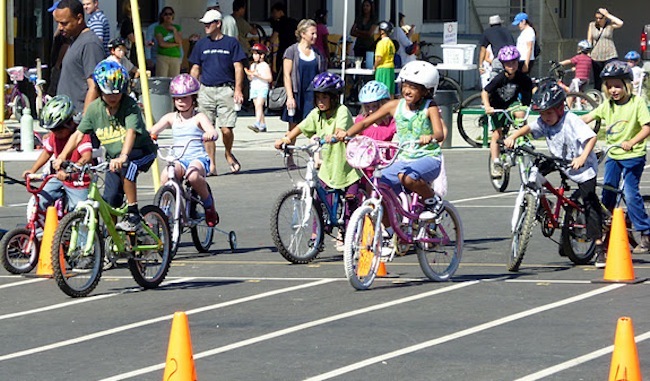 We can also provide rodeos for a fee for schools and events that are not eligible through Bike East Bay. Please contact sean@cyclesofchange.org and nora@cyclesofchange.org for more information. This rodeo provides parents and children of all ages with fun opportunities to roll play while developing their road awareness and safety skills. Participants can choose to be a pedestrian or a bike driver, deciding what they want to do and where they want to go in a mini-city complete with roads, signs, and buildings. These are great for community events!